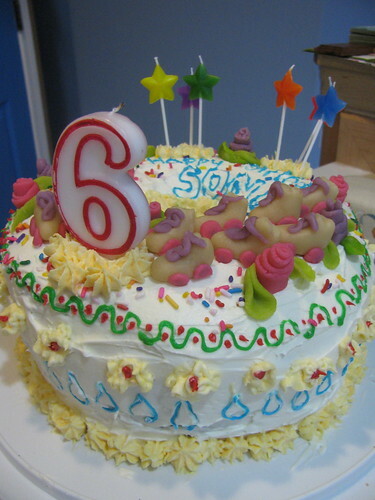 This year our daughter turned 6 and she wanted a "cake with rainbows...and also roller skates" because her birthday party was going to be at a skating rink with her friends. I have seen various pictures of rainbow cakes on the internet for a while now and have been wanting for ages to have an excuse to try it, so I was happy to finally get a chance! The "recipe" is really simple...it was just a matter of some extra time and lots of cleanup in the kitchen after. But so cool, and there were lots of ooohs and aaaahs from the kids when that first slice came out looking so unexpectedly beautiful! First, I wanted to start with a simple white cake. All the recipes I was finding in the books we have at home looked a little bit complicated, or they were more yellow cakes rrather than white, but I found a recipe online which I tripled to fit my big tube-pan that was super simple (and turned out to be really really yummy too) The original recipe was for a 9 inch pan but 3 of those worked out to be just perfect for my pan, even allowing for some batter-loss in this process when pouring this stuff into my cake pan. And the original recipe said to mix this in last, but Floyd told me that I was going to burn the gears on his stand mixer if I didn't add the liquid in so I mixed the milk in right away after adding the dry stuff and it worked out just fine. OK so now we have the batter - next comes the fun part! Divide into a bunch of different bowls and color with food coloring. 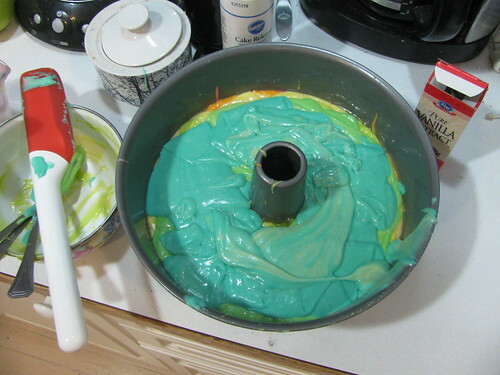 I happened to have a stash of "neon and pastel" color gets on hand as well, from previous decorating projects, so this cake got the entire color spectrum from the rainbow! 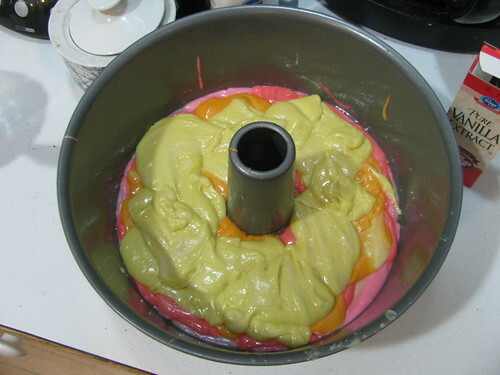 Next we start pouring our batter, one color at a time, into the well greased tube cake pan - one on top of the next. I wasn't perfect with it - just tried to have some of each color as even as I could get it across the top of the last layer. Next it went into the over at 350 degrees (F). The original recipe had something like 30-40 minutes for a 9 inch cake pan, but since this was tall and more it took more like a little over an hour. I just kept checking it to see when a toothpick came out clean. 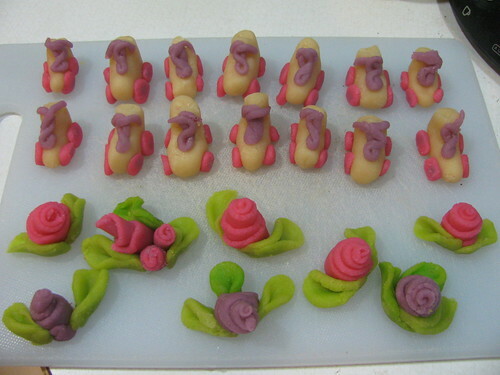 I made some flowers with the stuff I had left-over too. Now the next morning I made a big batch of the super delicious cream cheese frosting and instantly took care of any cake-crack blemishes and then piped the rest on for decoration. 2 packages of 8 oz. cream cheese + 2 cups powdered/confectioner's sugar - whipped with an electric beater until smooth. 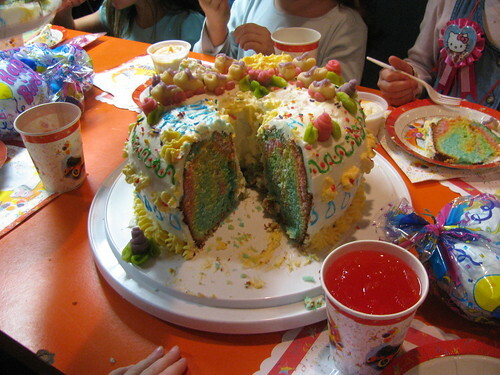 What a beautiful, colorful, festive cake! I'm sure the kids were thrilled. 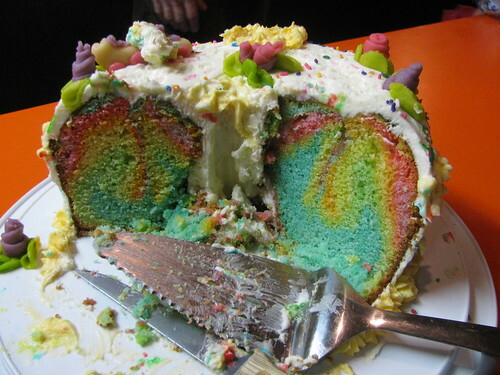 The layering of the batters produced a beautiful 'rainbow' crumb. You did such a nice job baking and decorating!!! Check your messages under account in top left of home page. What a happy cake! You're such a good mom! 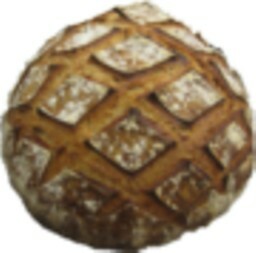 I have seen a three-color braided bread done with white dough (plain, cheese or garlic would work), reddish (sun-dried tomato), and green (pesto-flavored). Maybe it was posted here on TFL, but I could have seen it somewhere else. It was quite a while ago. 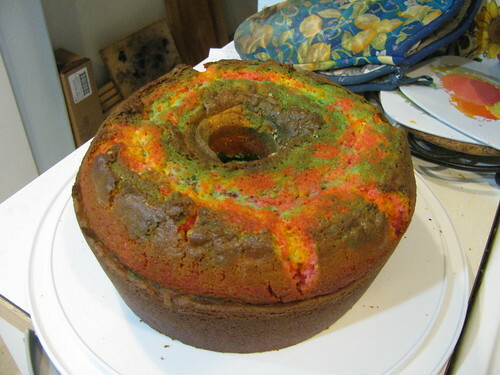 Your cake method could also work for Mardi Gras or Easter. Here's a similar idea using the same technique in a different type of pan. Could be a tiger or a zebra... or just a fudge ripple. Red and green for Christmas??? 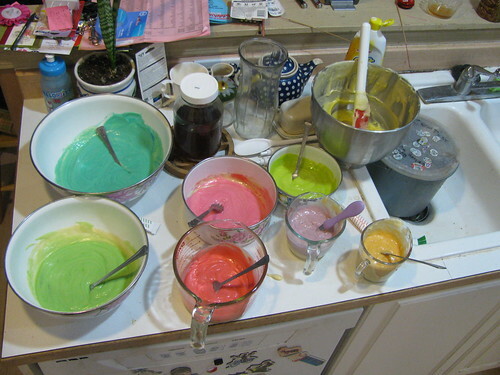 Beautiful Happy Colors of the Rainbow Cake! I think it makes everyone who looks at it, light up and feel happy! A lot of love in this cake! 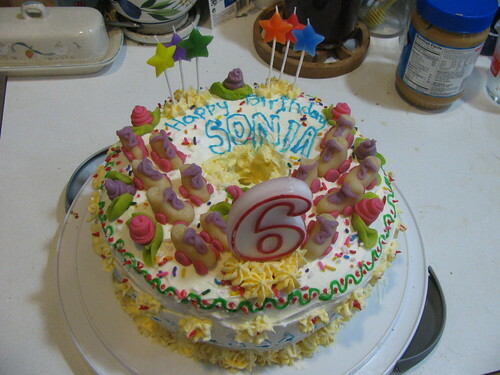 That's a beautiful looking and very unique cake and you went to a lot of trouble to make it. I'm really taken with the marizipan roller skates. Wow, your daughter is a lucky girl. 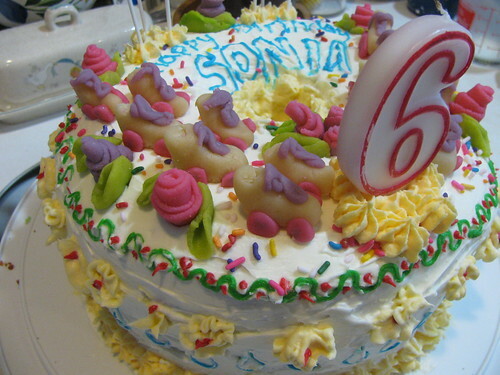 What 6 year old wouldn't love that cake? 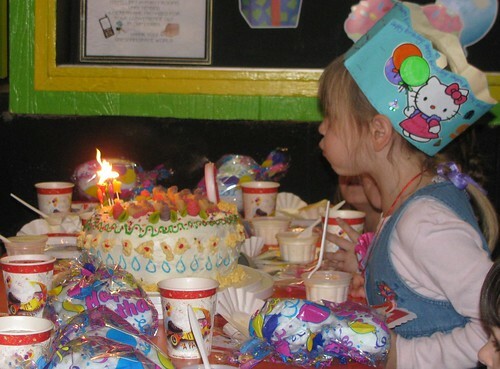 How will you top that for her 7th birthday? Do you know "The Australian Women's Weekly Cookbook - Fantastic Cakes" It is a great resource for kids cakes. I dont know that book...though the Cake Wrecks website always has fun stuff on both ends of the cake-decorating spectrum. My kids have come to expect the elaborate home-made cakes but their requests get pretty bizarre sometimes (like the "robot fighting a shaolin monk" one and I think that was the same year my daughter requested her cake to be "a Chinese Lion" (I usually post the cake pictures in my blog here - Floyd's the bread man and I mostly play with icings and decorating. :D ) I'd never compete with the pros that make the fancy books or make something that tries to look like a cake that someone who "knows what they're doing" made or I'd probably be dissapointed ;) - but just as long as the kids enjoy it I'm OK with that.